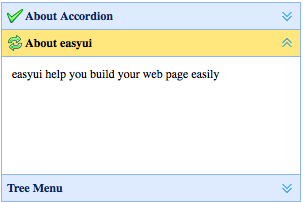 In this tutorial, you will learn about the easyui Accordion. Accordion contains a set of panels. All panel headers are all visible, but only one panel's body content is visible at a time. When user click the header of panel, the body content of that panel will become visible and other panel's body contents will become insivible. We will create three panels, the third panel contains a tree menu. Accordion is a part of easyui framework for jQuery. It lets you define your accordion component on web page more easily.